Daily Tottenham (AR) allocation introduced -Wood Green (WN) withdrawn. Sunday Enfield (E) allocation added. Sunday Enfield (E) allocation withdrawn. 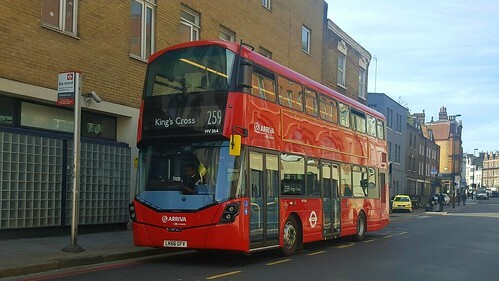 Withdrawn between Lower Edmonton and Waltham Cross except early journeys to Tramway Avenue - and further withdrawn between Kings Cross and Holborn Circus Saturday evenings. Mon-Fri Edmonton (EM) allocation re-introduced. Saturday evening service between Kings Cross and Holborn Circus re-introduced. Edmonton (EM) allocation converted to Metrobus. Tottenham (AR) allocation converted to Metrobus. Withdrawn between Lower Edmonton and Tramway Avenue. HOLBORN CIRCUS (Mon-Fri except evenings) - HOLLOWAY (Mon-Fri evenings) - MANOR HOUSE (Sat/Sun) Tottenham - Edmonton - Ponders End - Waltham Cross - Cheshunt - Flamstead End - HAMMOND STREET. Withdrawn during evenings between Holloway and Holborn Circus. Further withdrawn Sats between Manor House and Holborn Circus. Extended via withdrawn 279 from Lower Edmonton to Hammond Street. SUN withdrawn between Waltham Cross and Hammond Street but extended from Manor House to Finsbury Park. Mon-Sat AR allocation withdrawn - Sat and Sun E allocation withdrawn. SUN withdrawn. Tottenham (AR) allocation withdrawn. Withdrawn during late evenings but extended early evenings from Holloway to Holborn Circus. Re-routed northbound between Holborn Circus and Kings Cross via St Andrew's Street - Shoe Lane - Stonecutter Street - Farringdon Street - Farringdon Road and Acton Street - instead of Holborn and Grays Inn Road ie:same as southbound routeing. Mon-Fri extended from Edmonton Green Station (renamed from Lower Edmonton) to Enfield Garage. Sun service re-introduced between Edmonton Green and Kings Cross with early projections to Holborn Circus replacing withdrawn 359. Mon-Fri am peak journeys extended from Enfield Garage to Enfield Highway. Changeover point Ponders End High Street. Changeover point EDMONTON Tramway Avenue. Changeover point HOLLOWAY Nags Head.